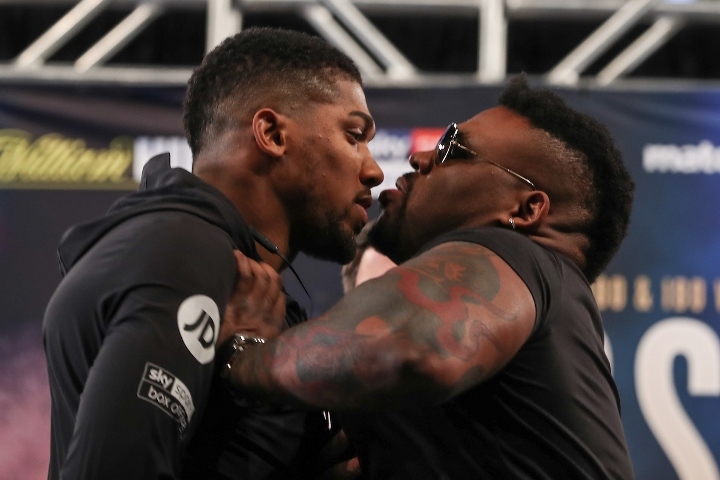 Eddie Hearn, promoter for IBF, IBO, WBA, WBO heavyweight champion Anthony Joshua, admits that it’s been “impossible” to replicate the physical qualities of Jarrell ‘Big Baby’ Miller in training camp. Joshua will defend his four titles against Miller on June 1, at Madison Square Garden in New York City. Both Joshua and Hearn admit that it’s been tough to find sparring partners, with Miller’s qualities, to properly prepare for the upcoming bout. Joshua is doing the best he can with the sparring partners out there. “There is no one really that big,” Joshua exclusively told Sky Sports. There is a lot of animosity heading into his fight. The two fighters have had very heated confrontations at two separate press conferences. Those press conferences have spurred Joshua forward, with even more motivation to get ready for the fight. Hearn has been involved in getting Joshua prepared, and he admits it’s been extremely difficult in securing the right sparring partners. “It’s very difficult. I’m very hands-on in that respect, and I get involved with sparring. We select sparring partners between [Joshua’s trainer] Rob McCracken, AJ’s training team, and AJ and me,” Hearn said. “To find a 23st guy, who moves fast, who has fast hands, who has a great engine, who forces the pressure, is very, very difficult. It’s impossible, to be honest, to [imitate] Jarrell Miller, in terms of weight, size, speed, feet, everything. We’re going to get as close as we can.